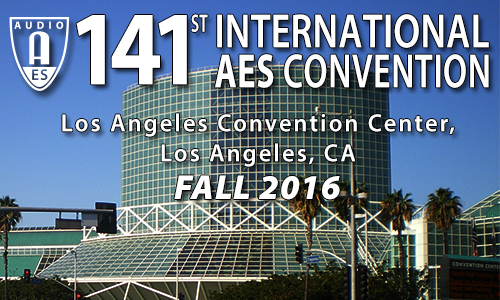 AES Los Angeles 2016 » 141st AES Convention | If it's about Audio, it's at AES! Interested in or work in Live Sound, Studio Recording, Home Recording, Music Production, Broadcast and Streaming, Sound for Picture, Networked Audio, Game Audio or Product Development? The 141st Audio Engineering Society International Convention has you covered in one exclusively end-user focused event. Exhibits-Plus access, free with a promo code, gains you entry to the exhibition floor and demo rooms, where leading manufacturers reveal and demonstrate the latest in audio hardware and software tools. The "Plus" includes the application-oriented sessions on the show floor stages of the Live Sound Expo and Project Studio Expo, along with other special events. AES LA 2016: Tools of the trade, breaking research, theory and application, historical perspective, student competitions and career development - presented by the best minds in audio! Yes! The world's largest pro audio end-user event returns to Los Angeles this September 29th 2016, for the 141st International AES Convention. Building on successes in New York in 2015 and LA in 2014, the Exhibition floor is poised for outstanding end-user contact. Drawing additional attendees into the Exhibition hall, the exhibit-floor stages of the Live Sound Expo and the Project Studio Expo are proven to increase exhibits area traffic. Concurrent with the Convention and co-located in the LA Convention center is the ground-breaking AES Audio for Virtual & Augmented Reality conference! High visibility and high performance sponsorship opportunities are available for the Convention, track sessions, the AVAR Conference and the LSE/PSE events. These sponsorships offer unparalleled advertising and branding benefits. Of course! Once you download our "AES Events" app you can install the specific convention that you're planning to attend. We use the same app for both our European and US conventions. Invest in yourself - register today!